Released by the BFI to celebrate its 50th anniversary ROUNDABOUT: 1963 – A Year in Colour, is a collection of ‘cine-magazines’ from 1963. Developed by the British Government for distribution throughout south and Southeast Asia, these ‘propaganda’ shorts were produced monthly and designed to promote British values and manufacturing. Made by Associated British – Pathé Ltd, they covered a range of subjects and took in places as far-afield as New Zealand and Pakistan as well as around the UK. They featured in the month of February a visit to the New Zealand Grand Prix at the Ardmore racetrack near Auckland, and also a look at cars being made at the British Mini and Vauxhall motor companies in England. An interesting feature in several films was the highlighting of materials grown abroad for use in the British market eg. the harvesting of timber in Burma and Borneo which was then used for the production of furniture in factories in southern England. On the downside the films are, by their very nature, dated. Their promotion of cigarettes being produced in one segment which are recommended for their ‘relaxing’ qualities, seems out-of-sync in today’s health conscious society, whilst the voiceover by Brian Cobby (best known as the first man to voice the speaking clock from 1985 until 2007) appears somewhat patronising. However his stilted ‘BBC English’ suits perfectly a series of films designed to promote Britain throughout a Commonwealth which at the time still held sway over large parts of the world. Though they may prove heavy going to take in at one sitting the short, segment-like format makes them ideal for dipping into periodically, and if approached in such a way the results are a fascinating taster of a forgotten era. 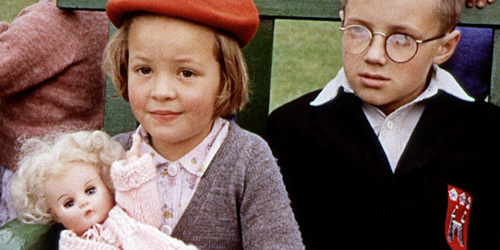 A perfect example of the Roundabout series (the complete collection of which is now preserved at the BFI National Archive), these films are invaluable in continuing the important work done by the BFI to preserve not only Britain’s film heritage but also an historical social record for generations to come. ROUNDABOUT: 1963 – A Year in Colour comes with an illustrated booklet, complete with an essay about cine-magazines by British Universities Film and Video Council research executive, Linda Kaye.